Winter squash is in season right now. If you have a cool place to stash a few, we encourage you to store a few for the winter months. Winter squash will last about 5 months in cool, dry conditions. Naturally sweet and especially nice during the cooler months, winter squash is the perfect vegetable for the fall and winter meals. Use them in place of white potatoes in soups and stews. You can also puree them and top with a little brown sugar as a sweet, healthy side dish. Blue Hubbard squash is a monster of a winter squash. They are inexpensive for their size, so choose a couple of them to prepare for storage when you can. To prepare the Blue Hubbard, use a sharp knife or hatchet to remove the incredibly tough outer skin. Usually the first cut is the hardest, then the rest can be cut off little by little. Do be careful. These are notoriously difficult to break open. Many times, people simple drop them onto the ground so that the squash breaks open under its own weight. Then, the pieces are peeled and chunked up for freezing. 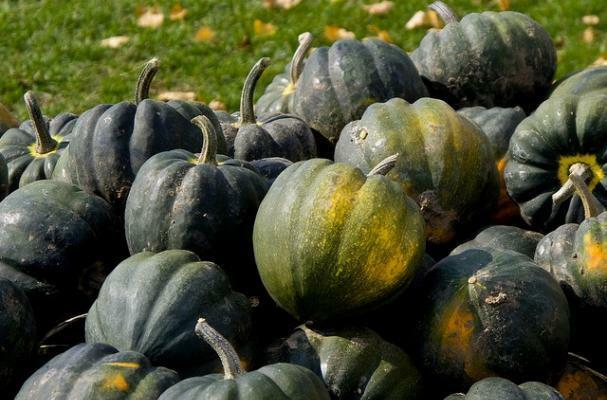 Blue Hubbard isn't the only type of winter squash. Anything from the Acorn to the Banana squash might be available at your local farmers market. Choose a variety of these delicious vegetables and enjoy this garden treat all winter long. Not just a side dish, winter squash also makes a lovely ingredient for pies, breads and cookies. Use them anywhere that pumpkin is used as an ingredient, and your family may never know that you didn't have a can of pumpkin in the house. I like making winter squash bread. It's a pretty loaf, golden yellow from the squash,and festive with it's braided shape. The naturally sweet flavor makes this bread perfect for your leftover turkey sandwiches as well. It's a great recipe! Mix these together and let sit until it becomes frothy(this is proofing yeast, and I always do this step to be sure my yeast is still good). 3 1/2 cup unbleached flour-keep a little extra on hand to add if needed. This amount varies with the humidity and type of flour. You will end up with a soft dough, so flour your surface well and knead the dough until it is smooth. Let ruse, covered until doubled. Stretch and roll each piece into about 18 inches long-not an exact science, just do the best you can. Grease a cookie sheet and place the three ropes side by side onto the sheet. Braid the ropes together, making sure to press and pinch the ends together so they stay. Cover one more time, and let rise until doubled. Bake 350 degree oven for 25 minutes.